Rahul Gandhi on Wednesday said that they will reassess and restructure the Goods and Service Tax (GST), if they come to power at the Centre in the 2019 general elections. 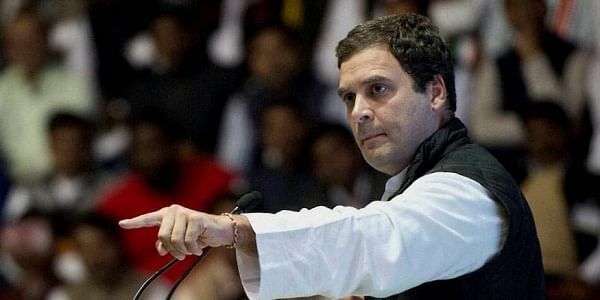 NEW DELHI: Congress vice-president Rahul Gandhi on Wednesday said that they will reassess and restructure the Goods and Service Tax (GST), if they come to power at the Centre in the 2019 general elections. Gandhi, who was interacting with traders in Gujarat’s Surat, said that the uniform tax regime required structural changes as the Central Government's version of GST was not right. “We were against the implementation of GST because the Government's version was not right. Eventually when Modi ji realized it was a mistake he said Congress was also a part of it,” Rahul said. He further said that ruling government’s version of GST is not the actual GST and accused the Centre of making the uniform tax reform “complex”. “GST is one tax reform not five tax. The Centre does not know the meaning of GST. They made the GST complex. We asked them for a simple version,” he said. Rahul further said that the Congress had warned the Centre that they were making a big mistake by implementing GST. “We also said that if they would implement it without any test then country would suffer badly. We asked them for pilot project,” he added. During the speech Rahul also compared the India’s economy with that of China and pitched for economic development and employment generation. “Our competition is with China in this 21st century. I am talking about economic competition here. China provides employment to 50,000 youth in 24 hour while India gives employment to only 450 youth. What China does in two days, India takes one year to do the same thing,” he added. Rahul also took a jibe at the Centre for favouring certain section of traders and ignoring the small and medium enterprises. “The small and medium enterprises can do miracle if they will get mere 15 percent of the assistance what the top industrialist are getting from the government. The Centre focuses only on 10 or 15 people,” he said.